This is the first of a series of guest posts from Jean-Paul Sartre the Existential Degu (JP). Sister Moonshine carried out some dérives (psychogeography trips) with me in the past, and it is not until now that JP has carved out his own niche in helping me with my research and teaching. 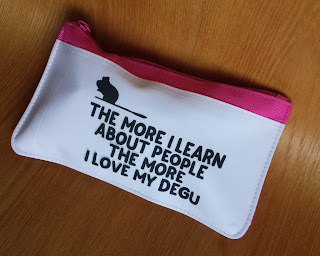 “The more I learn about people the more I love my degu”. Who is the ‘I’ in the sentence? Is it the sender or receiver of the gift, for instance? What can we say about this person? Is it a more generalised ‘I’ that could apply to a number of persons? What does ‘my’ mean? This word implies ownership, but, also, it can mean an association with. How can we establish which is correct? "The more I understand humans the more I am attached to my pet rodent"
My human believes that animals, while not ‘human’, are ‘people’ (in science the term is ‘personhood’ and some scientists and philosophers now believe this is the case, although plenty don’t – see the Nonhuman Rights Project for discussion on court cases in this regard). The ‘I’ in the text is my human guardian and the ‘degu’ is myself. My human owns the make-up bag. And, more importantly: My human has named me after an existential philosopher who was famous for saying “Hell is other people”. This is often taken out of context and misinterpreted (even though, in the context of the situation under discussion, it works quite well). What the quote is actually about (very simply) is our relationship with the Other and the subject/object dichotomy that comes into being with the gaze. 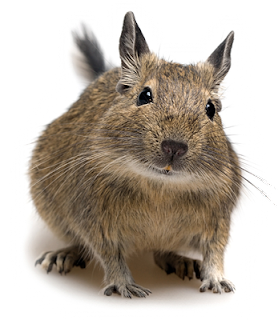 "The more I understand about my place in the world and my relationship with others, the more I appreciate how unique my connection is to Jean-Paul Sartre the Existential Degu"